As demonstrated by the four works on this disc, anyone who enters Anders Hillborg’s world of sounds is in for a surprise. Complexity rubs shoulders with directness, sensuality with humour, hypnotic meditation with pulsating rhythms, and all is combined with an original sense of form and unfaltering craftsmanship. Such qualities have brought international recognition, and Hillborg recently became the first Swedish composer to have a work premièred by the Berlin Philharmonic Orchestra when Cold Heat was performed in January 2011. Hillborg has called the symphony orchestra a ‘sound animal’, and he plainly delights in the effects that are possible to achieve when writing for the medium. His love affair with the orchestra started in the 1980s, when he abandoned electronic music, which had been his main sphere of interest until then. 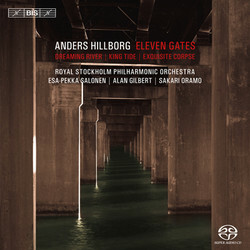 Around the same time, Hillborg formed a bond with the conductor Esa-Pekka Salonen, who here conducts Dreaming River from 1998 and Eleven Gates, a work he premièred with the Los Angeles Philharmonic in 2006. Although Salonen was a pioneer regarding Hillborg’s music, he is by no means alone in his enthusiasm today, however, as the impressive roster of conductors on this disc demonstrates. Sakari Oramo and Alan Gilbert are both among the most highly regarded conductors of our time, and also have a special relationship with the Royal Stockholm Philharmonic Orchestra in common, as its current and former chief conductor. With Hillborg one is always closer to a musical ‘yes’ than to a ‘no’, and when he describes his roots in the tradition they are to be found in Stravinsky’s appetite rather than in Schoenberg’s rules. 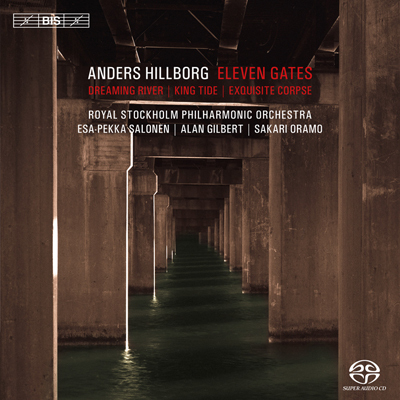 This generous music has struck a chord with the Stockholm orchestra, which commissioned both Dreaming River and Exquisite Corpse and over the years has performed no less than ten further works by Hillborg. The eminent orchestra has a distinguished discography, including a recent recording on BIS of Mahler's 9th Symphony which Gramophone accorded an Editor's Choice and described as 'a superb, devastating reading', with website ClassicsToday.com remarking that 'the playing throughout really is exceptional'.